Damasko is a family owned watch brand based in Barbing, a small village close to Regensburg, the Donau and the Walhalla in Germany. In 1994, “Damasko Feiner Uhrenbau” was officially formed and they used their expertise in metallurgy and machinery to manufacture advanced steel cases. Damasko had been in co-operation with Sinn for few years. In the end of 2002 they discontinued their joint venture. Sinn then co-operated with the SUG in Glashuette, and Damasko went its own way. The unique dark-silver appearance of the case is a product of manufacturing in-house, and is the absolute highlight of the DC 56. Case, crown and pushers are designed, engineered, and produced by Damasko in Barbing. The case is made of bead-blasted stainless steel and completely nickel-free. The case is highly scratch-resistant due to a special technique of hardening which is called “ice-hardening” (ice-hardened to 60 HRC or 710 HV) and is patented by Damasko. The case is four times harder than any other steel currently used in the watch industry. There is also an integrated anti-magnetic inner cage, anti-magnetic to 80,000 A/m. The case diameter is 40 mm (44 mm with crown), and about 46 mm lug-to-lug. It is a great fit even on a smaller 6 to 7-inch wrist. With a 14.00 mm height (13.70 mm to be precise), the watch fits comfortably under every shirt cuff. 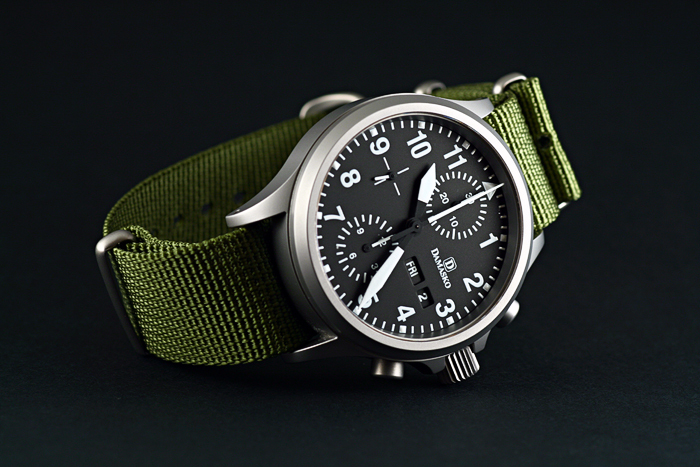 The case reminiscent of another German watch, the Sinn 756. The explanation is easy since Damasko made the case for Sinn 756 until 2002/2003. 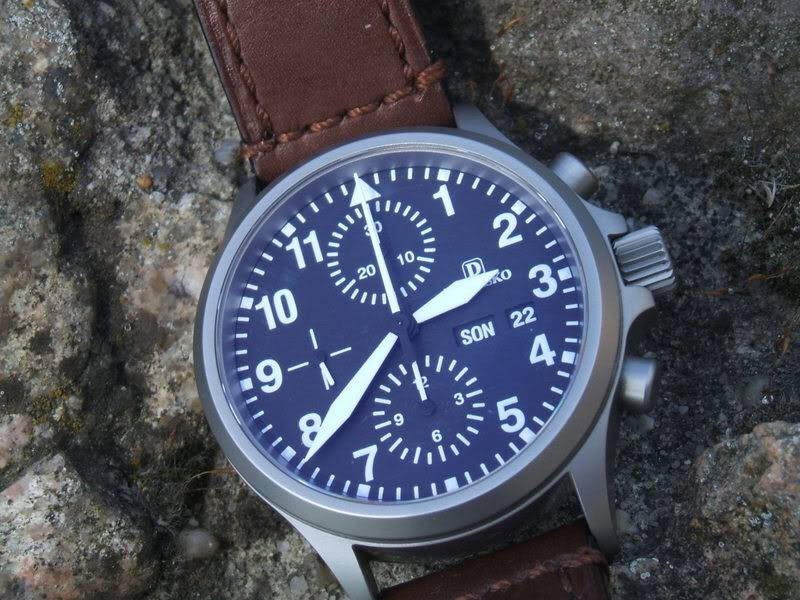 The current case of the Sinn 756 II is made by SUG in Glashütte, Germany. DC 56 can survive most situations, including harsh military environment, due to the hardened case. Even after putting it through various strenuous activities, it looks like brand new. The screwed down and corrugated crown fits perfectly between the guards. It is easy to grip and operates very smooth. The crown is signed with the Damasko “D” symbol. The crown itself feels solid enough to overcome any amount of pull out/push in operations. The chronograph pushers of the DC 56 are not screwed down. The advantage of screwed down pushers is that they prevent unintentional running of the sub-counters. But how often do we use the chronograph function in daily life to worry about unintentional running of sub-counters? The crown system has also patented by Damasko. Crown and pushers are also hardened and all gaskets are made of Viton. 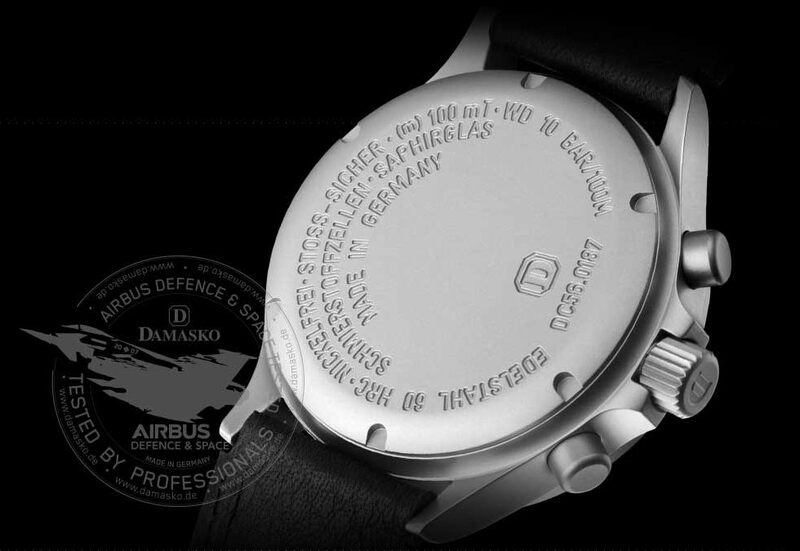 If you are interested in learning more about this fascinating technology, visit the Damasko technologies website. The solid case back is screwed in and marked “Made in Germany”. The case is rated WR 100m /10 bar. 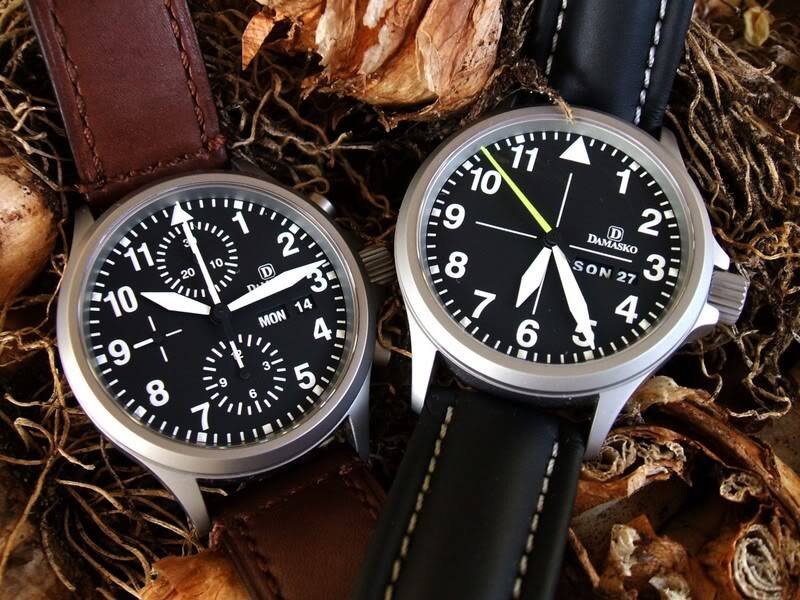 The dial is very typical of a military style watches – matt black with contrasting white numerals. There are no numerals on the 6’o clock and 12’o clock position in order to provide enough space for the sub dials for the overall readability. Due to the construction of the Valjoux 7750 movement, the minute sub-dial is placed at 12, hours sub-dial at 6, and running seconds sub-dial at 9. Hour markers and the triangle at 12 are coated with SuperLuminova C1 (white) which provides a sufficient readability at night. 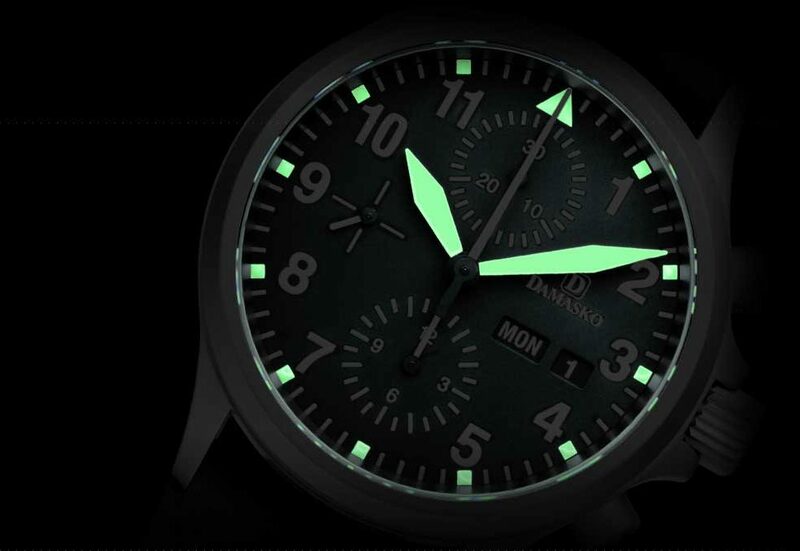 For the “real night owls” Damasko offers the DC 57 – a fully luminous dial. Usually you’ll find the day-date indication on a Valjoux 7750 based watch on the 3 o’clock position; the DC 56 is a bit different; the day-date window is placed between 3 and 4. The day and date wheels are printed in white on black which improves the readability of the small day and date indications. The day and date is available in German and English. All the hands have the same SuperLuminova white C1. The sword hands (hour, minute) differ from the first DC 56, they got bigger which adds to its legibility. The minute hand reaches well into the minutes chapter. Same with the central second-hand counter. The crystal is a flat sapphire crystal with highly scratch resistant anti-reflective coating on both the outside and the inside of the crystal. DC 56 comes with water resistant black 20 mm leather strap with white contrast stitching, and a bead-blasted steel pin buckle to match the case. There is also an option to order black rubber strap with pin buckle or a highly sought after Damasko steel bracelet manufactured in-house. 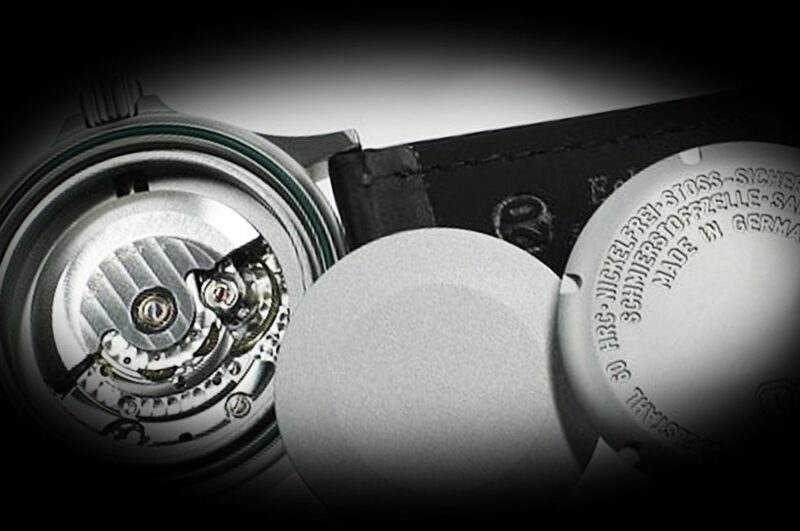 The Damasko DC 56 is powered by a Valjoux 7750 movement with day and date indication. This movement is known to provide a power reserve of 42 to 45 hours and is known to be very reliable. The movement runs at a rate of 28.800 bph, which means 691,200 beats per day! The Valjoux 7750 is shock proof and anti-magnetic according to the German Industry Regulations (DIN=Deutsche Industrie Norm). The movement is adjusted to 5 positions and an unscientific test by synchronizing to a radio-controlled Junghans Mega clock over 13 days, the average rate gain was +2/+4 sec/day (total: 42 sec). Price of DC 56 is €1,840 (including 20% German VAT). The DC 57 with fully luminous dial retails for same price. 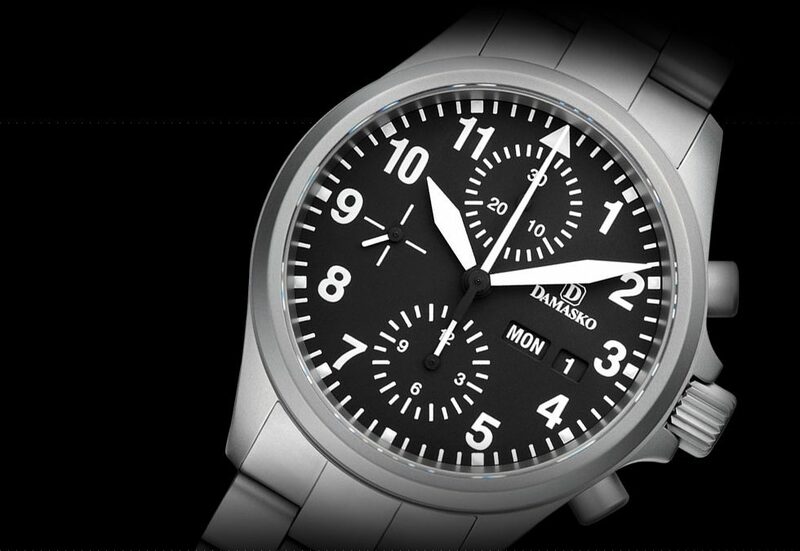 Watches can be purchased directly from Damasko website, or via regional resellers. 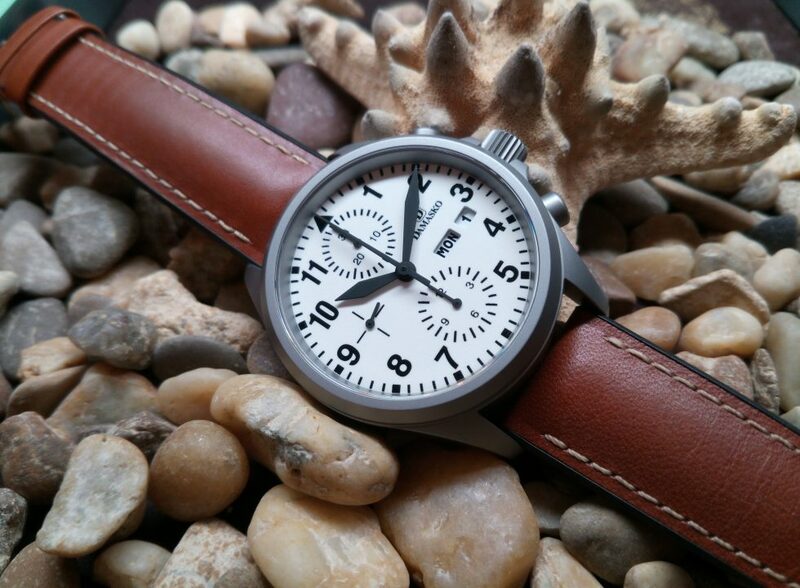 DC 56 is a high quality and military inspired tool watch. 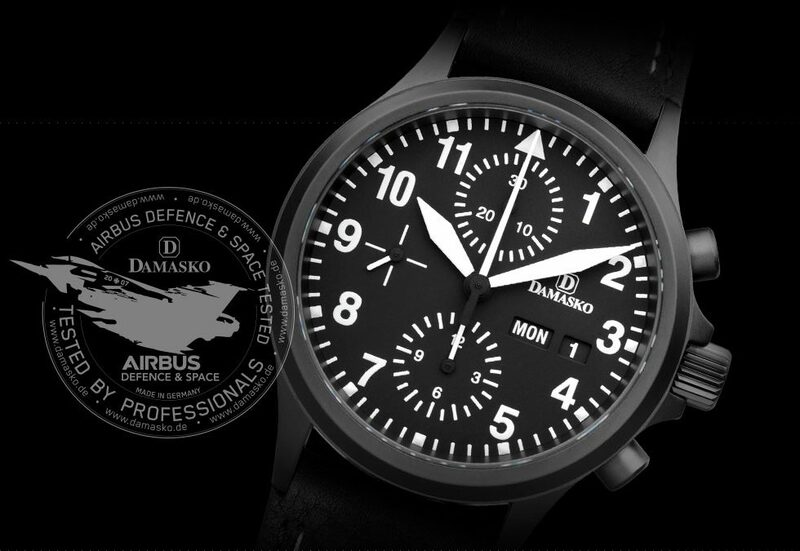 The technological innovations by Damasko become apparent upon wearing the watch. The price paid for these German technical innovations is a bargain compared to many watches priced around €5,000 with parts made in Asia and assembled in Switzerland.